Continental Carbonic will feature dry ice blasting products at the Institute of Food Technology (IFT) Show in New Orleans this June 22-24, 2014. Continental Carbonic has implemented dry ice blasting in several top food processing facilities as an alternative cleaning method that prevents moisture from being used in production areas. Cleaning with dry ice blasting reduces current bacteria counts, including Salmonella, E.Coli and Listeria while streamlining the cleaning process and reducing labor costs. In food processing facilities, dry ice blasting can be used to clean production equipment such as Ishida weighers and baggers, mixers, conveyors, packaging machines, slicers and more. Dry ice blasting is a cleaning process in which dry ice pellets are accelerated through a pressured air stream via a dry ice blasting machine to clean a variety of surfaces. Dry ice blasting is a “green” process since the carbon dioxide sublimates (or turns from solid directly to gas) during the cleaning process. To make an appointment to see Continental Carbonic representatives at IFT 2014, send an email to marketing@continentalcarbonic.com or visit us at here to add us to your Expo Plan. 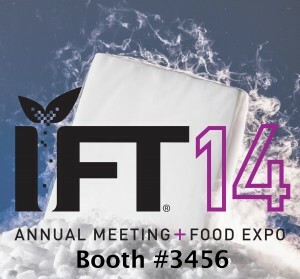 At the IFT show, visit the company at booth #3456, June 22-24, 2014 in New Orleans, LA. By submitting a comment you grant Continental Carbonic a perpetual license to reproduce your words and name/web site in attribution. Inappropriate and irrelevant comments will be removed at an admin’s discretion. Your email is used for verification purposes only, it will never be shared.